Take the hassle out of washing up with the Bosch SMV40C40GB. Large enough for 12 place settings, this model is ideal for families. Integrated Design This dishwasher has been designed to fit seamlessly into your built-in kitchen. The black control panel is located on the top of the door, which allows a cupboard door to hide the front of the machine. A red LED light shines on to the floor when the machine is running, allowing you to see if the wash has finished without opening the door. Programmes With a choice of four programmes with three different temperatures, the SMV40C40GB gives you plenty of options when it comes to cleaning your dishes. When you want to save time, use the Quick Wash programme. The Economy programme uses less water per cycle, making it more eco-friendly and energy efficient. This dishwasher also has a built-in Pre-Rinse cycle – use it prior to a full wash programme to help gently remove tough food stains. 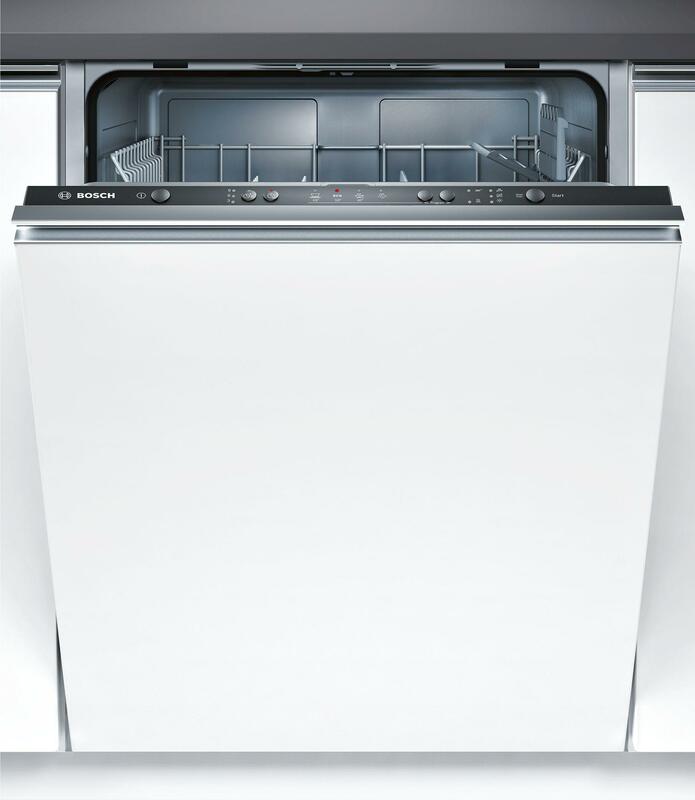 Performance You can expect sparkling clean, dry dishes after every cycle with this A rated dishwasher. It’s been awarded an A rating for both washing and drying performance, thanks to some innovative features such as the DosageAssistant dispenser. When the cycle begins, the detergent drops out of the dispenser and into a special tray on the top basket. This ensures it gets completely dissolved and reaches all your dishes. Efficient Cleaning Automatically adjusting the amount of water used for each cycle, depending on the size of the load, the load sensor achieves amazing results whilst minimising water consumption and electricity usage. The brushless Ecosilence DriveTM motor is efficient and guarantees low electricity consumption. As well as saving you money, this motor is exceptionally quiet. 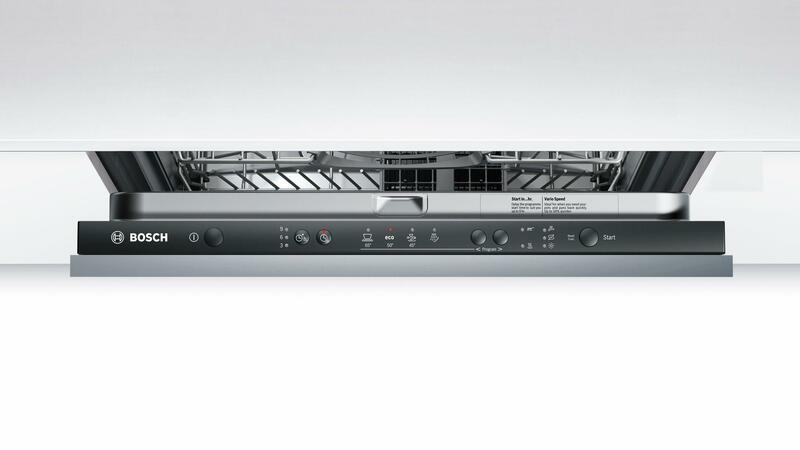 This dishwasher runs at just 50 dB, so you can operate it day or night without disturbance. Thanks to these innovative features, this Bosch dishwasher has been given an energy efficiency rating of A+, making it friendly to both your wallet and the environment. Our installation service covers the whole of Greater Manchester and also many parts of Lancashire. Our prices are constantly monitored to ensure that we are as competitive as national retailers. This Bosch SMV40C40GB is also available with a bespoke white glove delivery and installation service. Questions we have already received, and their answers, are shown below. You can ask your own question by clicking the ‘ask a question’ tab above. Most kitchen unit fronts should fit the machine as long as the old unit coming out is of the same dimensions. It is recommended you use a professional joiner to get the best possible fit. Bought for my son and daughter in law who are very happy with it and say it works efficiently and quietly. Helpful knowledgeable assistant made the purchase easy. Delivery was quick and on time. The fitting service was excellent. Everything I would expect from Simply Electricals. We were without a functioning dishwasher for a while and it is great to have one again. The service was excellent from start to finish. The dishwasher is extremely easy to use and the red light showing on the floor is really useful. We bought this dishwasher because we were fed up with our previous (different brand) dishwasher constantly breaking down and doing a substandard wash. With three small children the dishwasher is on often twice a day, and it is fantastic. Simply Electricals were very efficient with delivery and disposal of the old machine. 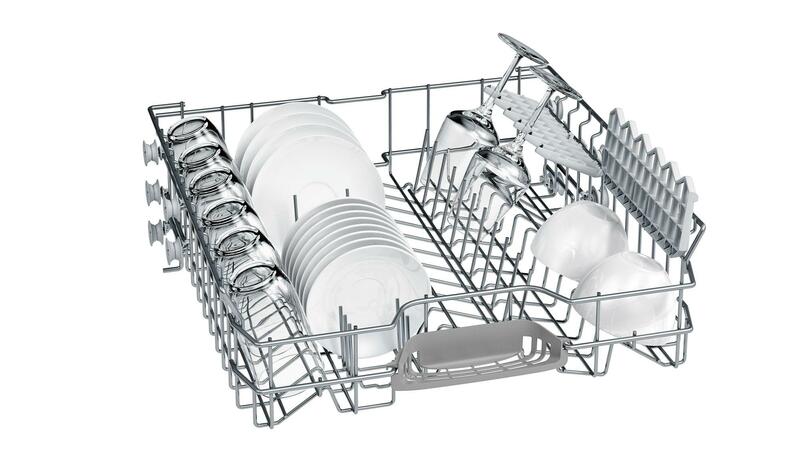 Washes well and is easy to use though the top rack cup and glasses space is on the narrow side. We were very pleased to see that this item was already very well price matched and did not bother to try and get a price match refund. As always the service and delivery from SE was excellent and the reassurance of buying from them continues.. This appliance delivers what it promises. Quick wash is excellent and is the main one we use as we always rinse dishes prior to loading [after all it's not a waste disposal unit]. Great feature is the light showing status of machine. Simply Electricals chaps fantastic as always. Well worth paying for installation since fitting integrated door can be a nightmare. Product was demonstrated and all questions answered. Dishwashing sorted! We did not need a lot of sophisticated extras. Just a simple wash. Delighted with the first month of use. Easy to stack and simple controls. I would highly recommend this dishwasher. Excellent results and easy to use. Great value for money. Built in replacement for older Bosch (non built in). Despite checking measurements it proved to be a very tight squeeze, but eventually if fitted in gap. Proving to be very good so far. Only negative I found the fitting/instillation instruction a bit tricky as only pictures not words. Could just be me !!! Given its price this machine is serving us very well. On the down side there is no upper tray on the left hand side for knives above the top tray and the time delay is 3, 6 or 9 hours, it cannot be set to any other delay time. This is a great value dishwasher. It is a little noisy but that is to be expected at this price. Washes the dishes perfectly including glasses which come out sparkling. The delivery and disposal service was also excellent. 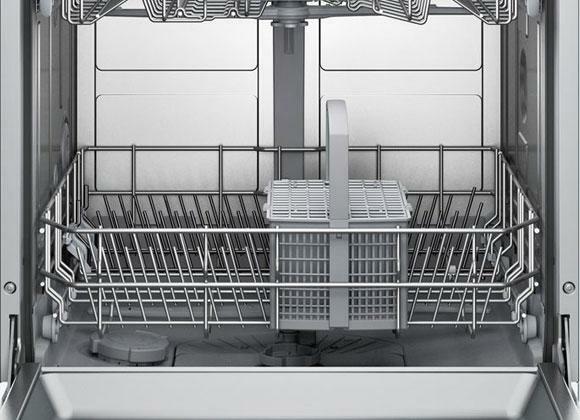 This is a good standard dishwasher with no unnecessary programmes. The results are very good even on the shorter programmes. The internal baskets could be more versatile especially the cup area. Really happy with our Bosch Dishwasher. It seems to fit more in than my old one despite being the same size! It isn't as noisy either and also has a light showing when it is in cycle. Always cleans well and great indicator light when you need to top anything up! Fabulous! Pleased with this purchase, quieter than my old machine and red light on floor feature works really well to let you know when safe to open again after a cycle. Easy to use. Delivery man ensured it fitted well. Machine seems reliable and cleans efficiently. Do have issue with the blade that seems low? Think I need to look again at instructions which tells you how to load the machine? Have purchased Bosch before- a reliable brand. Our old Bosch machine packed up after 17 years good service so it seemed sensible to replace like with like. This model appeared the nearest to our old one and was well priced at Simply. The delivery was spot on, very helpful guys brought it into the kitchen and took the old one away as planned. Installation was less than straightforward with the instructions being 100% pictorial. It took some time to get into the swing of it but we got there in the end. The biggest 'shock' was that the new machine was a good few centimetres shorter than the old one and the maximum adjustment of the legs were not sufficient to bring it up against the worktop. A couple of sheets of attic floorboard MDF under the new machine did the trick. The machine works a million times better than the old one, which must have been 'fading' for some time before it finally gave up the ghost. Cleaning on eco setting is now our default setting and everything comes out sparkling. One niggle, the cutlery basket holes are too small for much of our knives and forks. the lid does flip to allow larger items so it is not a major flaw but the old one had larger holes in the top - why change? Overall, very happy with the machine. Not had it long enough for a proper revue. Does the job but is noticeably noisier than our last dishwasher. Our last one was virtually silent - this may he the norm? Really easy to use and maintain. Perfect for a busy family. Simple to use, although I found the instructions initially a little cryptic, and I am still not sure I am getting the best from it since the instructions are only pictorial. However, it was beautifully fitted by the excellent team at John Lewis, and I has the hum and handle or a really high quality machine. Replaced an ancient built in dishwasher with this one. Fitted it myself with little difficulty, love that the rear height adjustment is done from the front of the machine. The difference in the results over the old machine are huge. Sparkling clean dishes, including baked on food residue. A couple of really badly caked on items defeated it, but to be fair I'm using Lidl own brand dishwasher tablets, I'd wonder if the more expensive ones might have made a difference? Everything else on these "budget" tablets has been fine. Great idea to have the floor light indicator for when the dishwasher is active - no more mistakenly opening the door mid-cycle! The dishwasher is pretty quiet - noisy when filling and first starting up but that's normal in my experience, pretty unobtrusive after that. All in all very happy. Worth noting that the Economy setting takes a very long time, probably best done overnight, and to be honest I don't think the results are as good as the regular wash. Probably best to use for lightly soiled dishes, not for pots & pans etc. Didn't feel we needed all the bells and whistles so went for the basic Bosch and we are very pleased. Cleans brilliantly, pretty quiet, takes loads nearly had to go buy some extra crockery. Really happy with it. An excellent machine. Cleans thoroughly even the most sticky and dirty crockery. The dishwasher was a good price without too many unnecessary features. Very useful short programme. Bought this after a recommendation and it has proved to be excellent. The red light shining on the floor when operating is an excellent feature. Would definitely recommend. Chosen and bought in an emergency just before Christmas. The machine does everything you expect and is nice and quiet in comparison to our old one. The installation guys were fantastic and couldn't have been more helpful. We had to replace our old model which wasn't worth repairing, I called Bosch for advice on a new model with same specifications, ours was narrow apparently but honestly it looks normal size. Anyway it's a great replacement. Very quiet. No noisy end of cycle beeping that goes on forever, washes the dishes really well and we got the Simply Elecricals installing service too. Def worth the money to install our our integrated model. Very good product, quiet as expected it would be. Happy with the purchase and price. This is my first dishwasher. It suits our needs and so far has washed all manners of soiled dishes that have all come out sparkling. My one gripe would be that despite it being one of Bosch's quieter machines I still find it noisey We tend to use the 65 degree setting as it comes out drier. Replacement for a 20 year old dishwasher. Along with many domestic products over the intervening years the materials used are all slightly lighter/thinner giving a less quality feel to the product. The machine however works well and is reasonably quiet, enough programs without being unnecessarily over complicated. I like the delay start function for overnight washing. Good value product. I had purchased Bosch products previously and had always found them good quality and very reliable, so a Bosch dishwasher was a first choice. This model is remarkably quiet, so much so that on a couple of occasions I had to go back to check it was on! It has all the programmes most people need, heavy soil, delicates, eco etc. so very happy that my dishwashing needs are catered for. Easy controls, and getting salt in is very easy too. As expected the machine feels like a quality build and the door and seals shut with a satisfying clunk. I would certainly recommend this machine without hesitation. Overall this dishwasher washes well and apart from some glasses and mugs dries well also. The only exception has been when I have used the quick wash. The dishwasher tablet has not completely dissolved and some debris has landed on items in the top basket. It is reasonably quiet and using the vario speed button the cycle is not overlong. My main complaints concern the baskets. The bottom one can slide off the runners too easily and the top one is difficult to load, particularly with various glasses. There are several glasses that I could fit in my old machine that I have found impossible to load safely in this machine. My previous dishwasher lasted 28 years but I have my doubts that this will be the case with this one. We have had this dishwasher for around a month as a replacement for an old MFI machine, and cannot fault it. It cleans very well, even on the fast cycle. We opted for installation and the guys were extremely professional and kindly demonstrated the functions. The drying function is much better than the old machine, with only the odd bit of water left in the bottoms of bowls etc. I bought this dishwasher having had the freestanding model before moving house. The big plus is the 30 minute program. I use it all the time and get perfect results. This is such a useful feature when entertaining because of the quick turnaround time allowing 3 loads in a couple of hours. I would certainly recommend this model and Bosch products are always so reliable. Easy to fit. Just a bit fiddly to get the cupboard door to be in exactly the right place. It's a very quiet machine and it's just as well it has a red light to indicate when it's on otherwise you could open it by accident. Cleans well. Simple programs. Good machine for the price. 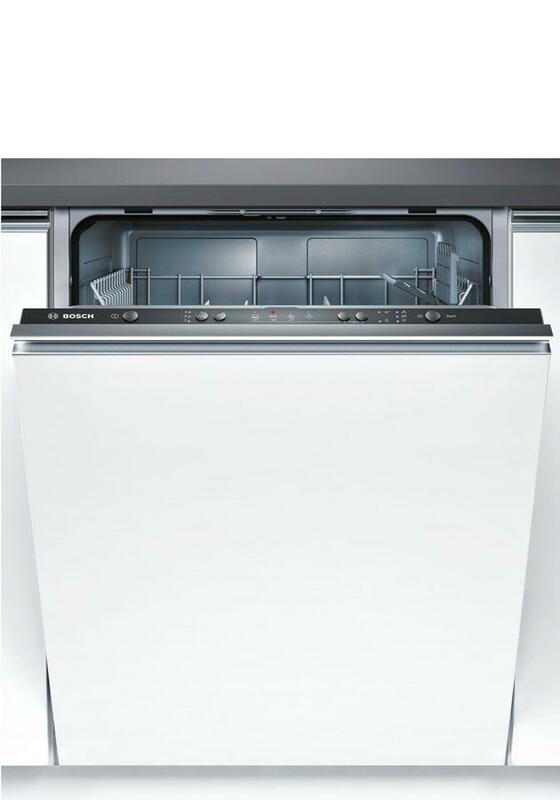 Great dishwasher, lots of easy to use functions and warning lights for when more salt or rinse aid are needed. I like the 'on' light that shines on the floor too. Nice and quiet, no overly loud and prolonged beeping like my old machine. Only downside is that it can be difficult to load with lots of stuff - seems to hold less than my old machine, but it may just be that my plates and bowls are too big. Highly recommend the fitting service! We are really pleased with the dishwasher. It is so much quieter than our older model bought 12 years ago. Things have certainly moved on. 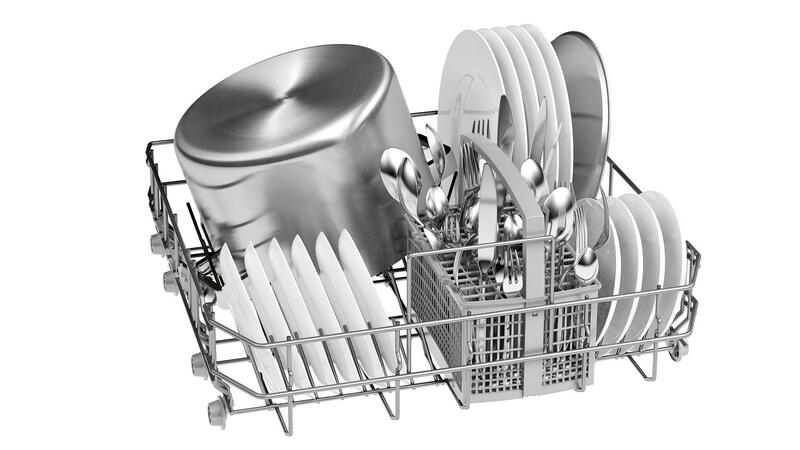 Excellent dish washer easy to use. Instructions clear but do give yourself time to read them. Solid built and really great value considering the make and overall quality. Saved lots of time so I can spend less time with dishes and more time with loved ones. Can't rate it high enough. We have only had this dishwasher a couple of months but so far we have been very happy with its performance. It cleans crockery and cutlery well and all items are nice and dry when they come out of the machine after the wash.The instructions are straightforward and easy to follow. Our previous Bosch Washing machine lasted 12 years - hopefully this will serve us as well!! Lovely machine. Easy to use, washes perfectly. Wish I hadn't been so mean with myself and opted for digital timer display on floor. That would have been so cool! We wanted a replacement for our last dishwasher of 18 years. We wanted something simple that does the job. This machine is very quiet and does a good job but doesn't feel as well built as they used to be. The programming instructions are not easy to,understand but once we got used to then it works well,and we are happy with it. I wanted a good, reliable dishwasher. Bosch has a good reliability rating (Which magazine) and this model was at a good price. Which Has since reviewed this model and it got a reasonable score. Have found it washes well. Nice and quiet. The economy setting does take a long time. Overall very happy. Very pleased with this dishwasher. I particularly like the quick wash cycle, which cleans the dishes very well. It is also very quiet and the red light on the floor lets you know when it is on. The dishwasher is great, enough programmes to suit and easy to use. The installation sheet was useless - recommend to keep YouTube to hand! Having just moved and having trouble with our integrated dishwasher, we chose this model as have always been happy with Bosch. This model is easy to load, has lots of space and the clean finish is excellent and we love the red light that beams on the floor and goes out when the wash is finished, very useful as it is very quiet. Delighted with product and service.